In the last few weeks of my practicum assignment I was hoping to reach some over-arching conclusions, or make some great discoveries. Unfortunately, not much has changed. I did try to video conference someone but it didn’t turn out well. I was a little skeptical to do so, being that I didn’t know any of the people I would video chat with. However, I just told myself it would be like Chatroulette, only a little less risky because I knew the people from a chat, and I tried to pick the most normal person I could find. My concerns were that they would not think I look 13, because I don’t. And also that they would be really creepy and try to flash me or just say something weird. I settled on “Farahsara” a girl age 15 (supposedly). We decided to video conference to say hi and show each other our nail colors (I couldn’t think of anything else to relate to her about). Unfortunately it said the connection wouldn’t go through and our devices would not connect to each other. Other than this attempt to try something new, everyone mostly remains the same, talks about creepy stuff, and is only interested in naked girls and speaks unidentifiable chatroom language. 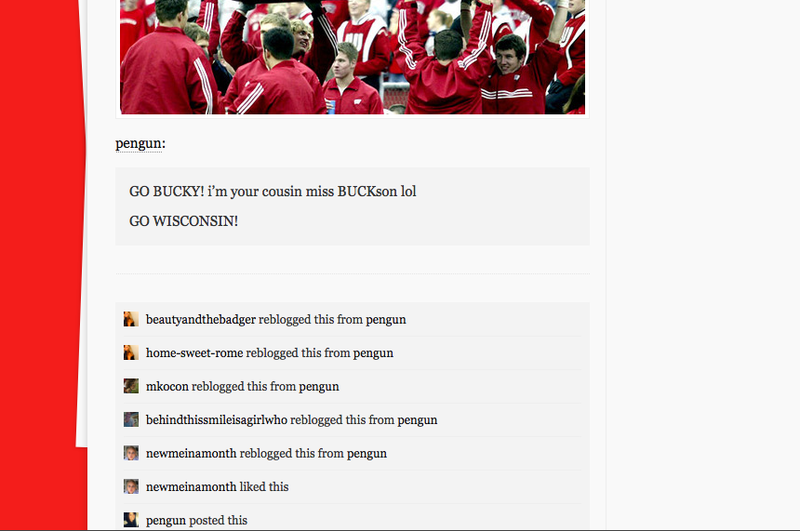 First, I created an anonymous post. I was curious to see if people would respond more to someone that is a member or someone that is just on the website looking for advice. I commented under the personal section and asked the group how they feel about growing old and to NOT to my surprise, no one answered. This proves my theory that senior citizens strive to build connections and are definitely hesitant to open up to strangers or anonymous contributors. Thanksgiving is just a few weeks away! I have a delicious recipe for sweet and sour meatballs that can be a fabulous addition to your Thanksgiving meal! Place the ground meat into a bowl with one cup of breadcrumbs and an egg. Mix thoroughly. Season mix with a few pinches of salt and pepper. Heat up a skillet on the stove to medium heat. Mold the meat mix into tiny size meatballs and cook them on the pan. You will probably have to do this in shifts since all of the meat won’t fit at once. As each meatball finishes cooking, place them onto a plate lined with paper towel, to remove the grease. *NOTE: the meatballs only have to cook until they are browned on the outside. you don’t want to overcook them or they will lose the juicy flavor! Meanwhile, pour the whole jar of jelly and whole jar of chilli sauce into a dutch oven. Then, fill both empty jars up with water and pour them into the mix as well. Turn the stove on high heat. Once the sauce starts to boil, add one teaspoon of baking powder, which will thicken the sauce. After that, turn the heat onto low, so the sauce it at a simmer. Place the cooked meatballs into the dutch oven with the sauce. Put the lid on the dutch oven and let the meatballs soak into the simmering sauce for about 30-40 minutes. Well Anne, I don’t have much Swedish recipes in my personal cookbook – this happens to be my only one but it has been passed down for years in my family so I am glad to hear you can bring this tradition back to yours. Please let me know how the meatballs come out – hope they are delicious! 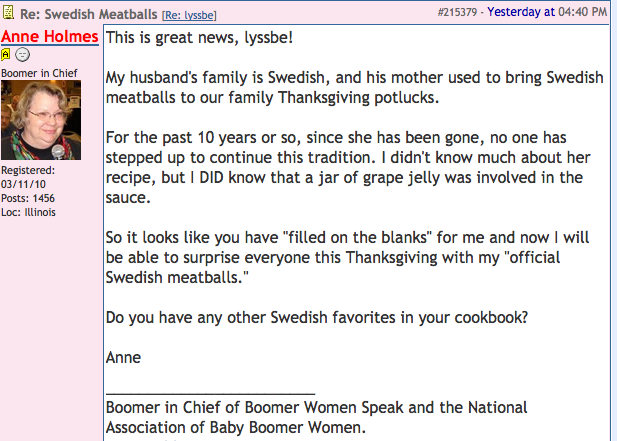 I hope she enjoys the meatballs – its really crazy to think that Anne is going to be using MY recipe at her family Thanksgiving. I feel like this has been a successful forum experience.